Sale of land will help the 160-year-old Ag Society unshoulder its burdensome debt and create an endowment, leaders said. 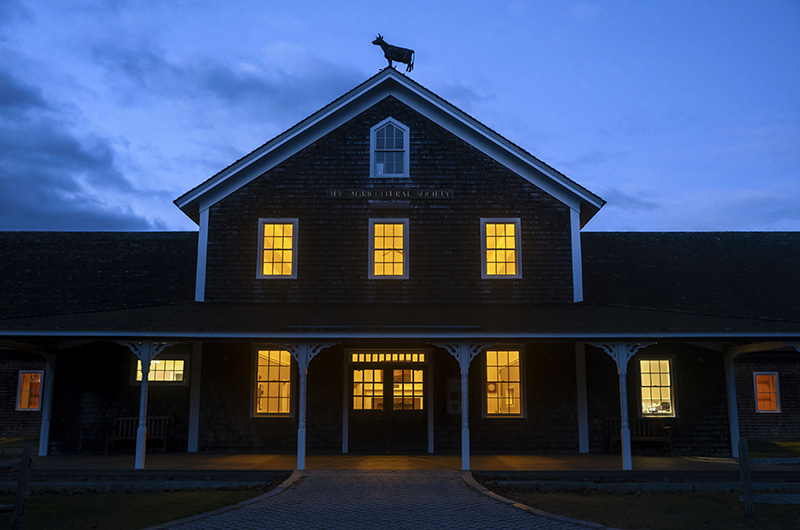 The Martha’s Vineyard Agricultural Society is set to sell approximately 10 acres of its land in West Tisbury to the Martha’s Vineyard Film Festival, both organizations announced this week. The nonprofit film festival, which has long been searching for a permanent home, wants to build a year-round gathering space and venue on the property. And the sale is expected to help the Agricultural Society unshoulder a burdensome debt it has been carrying for years, and create a small endowment. Both parties declined to disclose the sale price. But according to a copy of the offer to purchase obtained by the Gazette, the price is $1.8 million. Named signatories on the document are Stephen Bernier, president of the film festival, and Brian Athearn, president of the Agricultural Society. A date of May 9 is set for executing a purchase and sale agreement, with a tentative date of June 26 set for a closing. The film festival’s plans for use of the property have not been described in detail beyond a general plan for a barn and community event space. door screenings and events throughout the summer. In recent years, the festival, which operates out of rented space in Chilmark, has also developed an emphasis on arts education for youth. Mr. Athearn said the society and the film festival have been talks since last summer, when the two groups collaborated on an outdoor drive-in movie screening. He said the sale of the land will eliminate a sizable debt that the society took on 2011 when it bought the land for $800,000, under previous leadership. The installation of a solar array on the property was intended to defray the costs, but revenue from the project never materialized as expected. According to public land records, the society has taken out three mortgages with the Martha’s Vineyard Bank since 2011. An $800,000 mortgage was taken out in 2011; a $550,000 mortgage dates to 2016 and a $200,000 mortgage was taken out in 2018. The primary source of income for the society is the annual livestock show and fair, held every August. Mr. Athearn said the sale will also help to establish an endowment for the 160-year old organization. He said while financially strapped, the society was not looking to sell the land, and the idea emerged through the relationship with the film festival that began last summer. He said he did not take the sale lightly, and was amenable partly because of his comfort with film festival leaders as partners. The deal was complicated at the last minute when Mr. Athearn learned that the Polly Hill Arboretum had what he described as an informal right of first refusal on the land. Last week, the arboretum indicated interest in making a purchase, Mr. Athearn said. Named for the acclaimed horticulturist Polly Hill, the arboretum is a nationally registered historic landscape that abuts the Agricultural Society property. Mr. Boland said a fenced-in portion of the arboretum known as the playpen near the southern border of the property is a popular attraction for visitors, and an area of concern in the event of development nearby. “Our interests were to try to create a buffer or protect what I would say is the serenity and quiet like nature of the arboretum, particularly on our southern border,” he said. Mr. Athearn said film festival leaders were sensitive to the arboretum’s position throughout. “The film festival agreed they didn’t want to buy the land if there were going to be any overtones about it,” he said. He said representatives from all three groups have since agreed to form a working group as plans for the properties unfold. “I’m looking forward to working with Polly Hill and nonprofits as a group,” Mr. Athearn said. Mr. Athearn said the purchase and sale agreement will include restrictions, including setback requirements and limits on the footprint of insulated buildings. The parcel of land in question has changed hands several times in recent decades. In 2002, the Martha’s Vineyard Museum (then the Martha’s Vineyard Historical Society), Polly Hill and the Agricultural Society jointly purchased 25 acres of former Littlefield family land, known as Scarecrow Farm, abutting the arboretum and the Agricultural Society. The three organizations split the land, with five acres going to the society, 10 acres going to the arboretum, and 10 acres going to the museum. When the museum abandoned plans to build a new facility on the property, it sold the land to Polly Hill and the Agricultural society in 2011, with the society paying $800,000 for 7.78 acres. The 9.75-acre parcel to be sold to the film festival includes the 7.78 acres and two more acres of Ag Society land. The society will retain the rights to the solar array and income generated by it, both organizations said in press releases. The film festival has been looking for a permanent home for years. In 2016, the festival bought a residential property off Old County Road in West Tisbury, but later sold it after backlash among neighbors and town officials. Mr. Bena said the new planned purchase is a major milestone. “We’ve been close to a decade looking for a place to build a home,” he said. Great news for the Vineyard, but we will miss the Festival in Chilmark! This is awesome! Great for both the Film Festival and and the Ag Society. I’m proud to be part of the team that is creating this gathering space. We want it to be for the whole island, all ages, and all art forms. The planning and building process will take time and we are seeking input from the community. Get involved at tmvff.org/news. As a West Tisbury resident, I am looking forward to this. It will be a wonderful addition to the town in a great location. This takes a lot of financial pressure off the Agricultural Society. Congratulations to all! Congratulations Thomas, Brian, Ag Society & MVFF. Sounds like a win-win wonderful use of land & funds. It will be beyond wicked terrific to have two "home grown" film venues on Island. Congratulations to all involved;and all who will benefit. Chilmark's loss is the Vineyard's gain....well miss the Hay Cafe. Well, I think it is a shame. Everyone does a fundraiser at the Agricultural Society barn, yet apparently the Society was unable to do any fundraising on its own behalf to pay down the mortgage and build an endowment fund. And what about the Ag Society membership? Shouldn't they get to vote on the decision to alienate a large portion of the Society's only real asset and true "endowment," which is the land? And the rumored price seems to be way too low for 10 acres. Actually, it's nothing in today's world. Does the Ag Society have a plan to invest this money and get an income from it? How much of it will they spend to hire a consultant to do this for them? Or will they just spend it down? How many $$ will the MVFF being throwing at building the new "campus"? The word "campus" originally meant "plain" or "field." Now it means a cluster of buildings and accompanying infrastructure. Next to Polly Hill. What a shame. Isn't it ironic that the person responsible for the film "One Big Home" is now the one building the Big Home for MVFF? What a shame to clear more land and increase traffic in this special district of West Tisbury. The Island can't take much more of this or it will surely sink. Does Thomas Bena think he's building The Acropolis? Very exciting to see these non-profits working together for this project. I think this is a much needed space for WT and the Island as a whole, thank you to the Ag Society, MVFF and Poly Hill for making this happen. Is the film festival going to pay taxes? Maybe a Payment In Lieu Of Taxes if they are an actual charity by MA standards. Now is the time to negotiate that PILOT.